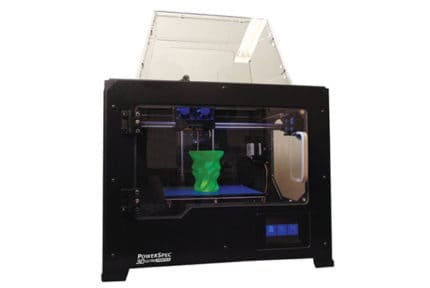 The PowerSpec 3D Pro follows in the company’s tradition of copycatting the massively successful MakerBot range from a design as well as a hardware point of view. Similarly to other models in the PowerSpec range, the 3D Pro is very much a cost-cutting iteration of the MakerBot Replicator 2, and as such, it’s worth approaching it with a degree of skepticism, especially if you are expecting a model on par with MakerBot’s offering. With that said, it does appear to sport a few improvements on its inspiration and with a significant price cut as well. 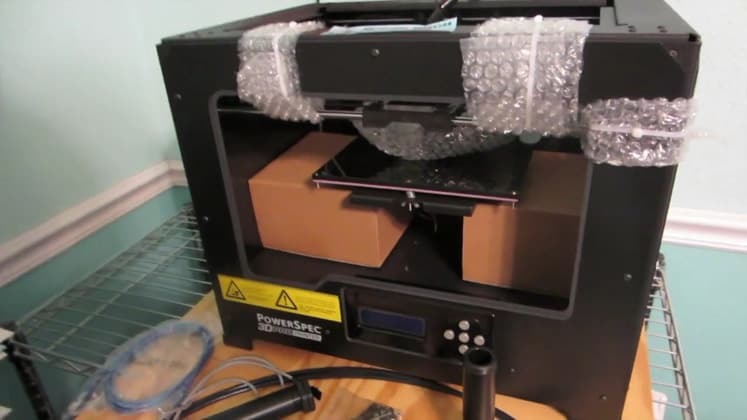 Today, we investigate the PowerSpec 3D Pro to determine whether its worthy of the cost. 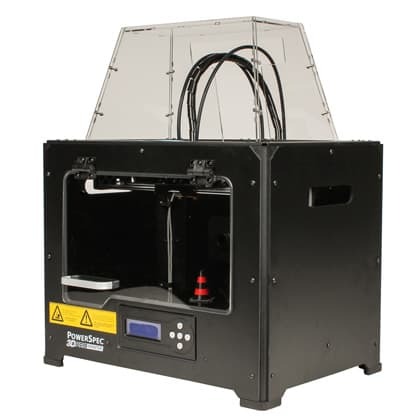 In terms of design, it is very much a duplicate of the MakerBot Replicator; the metal chassis holds the 3D Pro firmly on its feet coupled with glossy wooden panels on all sides as well as a removable hood that sits atop the printer. Both the left, right, and front panels are fitted acrylic windows, the front of which is hinged upwards for access to the build area. 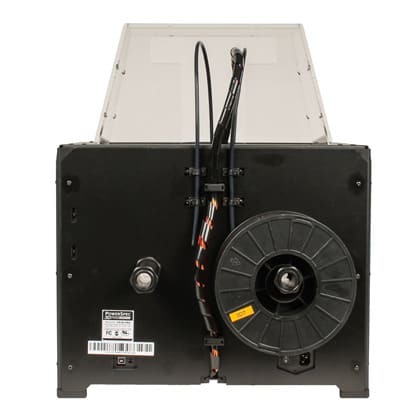 The enclosed design serves not only to manage internal temperatures for ABS printing (insufficient heat can cause warping) but also to provide a degree of protection and a boxed, all-in-one feel. The all-black color scheme returns for an ordered look that we are rather fond of for the stripped back, yet stylish, functional appeal. It also weighs slightly more than the Replicator 2 at 32 lbs. 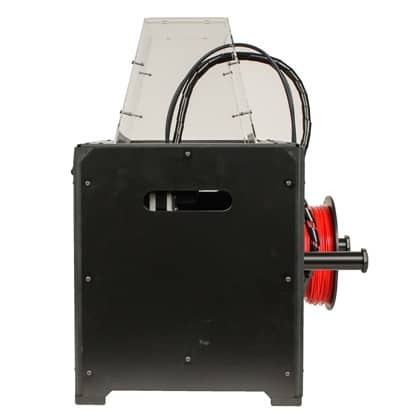 The PowerSpec 3D Pro has a build volume peaking at 226 mm x 144 mm x 149 mm and employs additive FDM technology, which is pretty much standard fare for sub-$1000 printers, alongside the usual internals centered on a belted XYZ configuration powered by stepper motors. The bed is heated linking up with the ABS compatibility of the printer. The printer is capable of layer resolutions within a range of 100 to 500 microns thanks to a dual direct drive extruder setup fitted with two 0.4mm diameter nozzles. XY precision comes in at a more than respectable 11 microns and print speeds approximating 24cc/h. The PowerSpec 3D Pro can print in ABS, dissolvable PVA, and PLA in standard 1.75 mm diameter filament with an open source template. 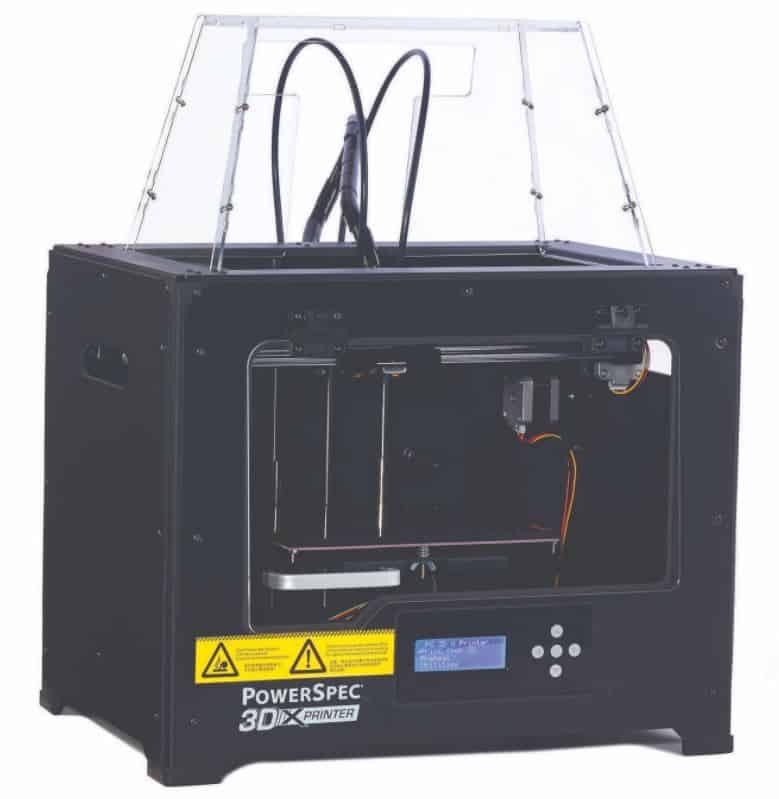 The enclosed design is more tuned towards ABS, but removing the hood and opening the door provide sufficient ventilation to allow noxious fumes to escape when using PLA. The PVA is primarily used for support structures with the option to fit one of the extruders with ABS/PLA and the other with PVA. 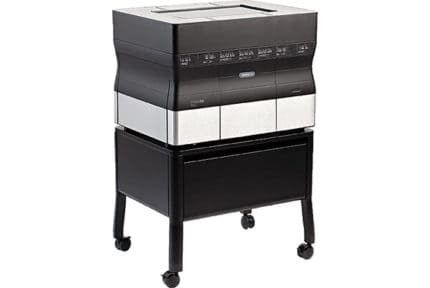 On printer control is within a monochrome LCD fitted on the bottom right of the front panel with a circular five-button tactile interface to navigate menus. The PowerSpec 3D Pro is somewhat of a let down with only SD card connectivity with no possibility of linking it to a PC for easier data transfer. The SD card setup does allow for untethered use though. PowerSpec delivers the 3D Pro with ReplicatorG as a slicing tool, which can convert STL and OBJ files. Due to the SD card configuration, any open source slicer will work such as Slic3r or Cura for example. If you opt for ReplicatorG, note it only works with Windows machines and not Mac or Linux. Additionally, it is slightly outdated having last been updated back in 2012, and in our opinion, other alternatives are a better bet. One of the biggest appeals of buying PowerSpec is getting a fully-assembled printer for the cost of a kit. It means convenience and avoiding a few hours of frustrating from scratch assembly, making the 3D Pro far more attractive to a first timer without the hands-on experience to construct a kit printer. 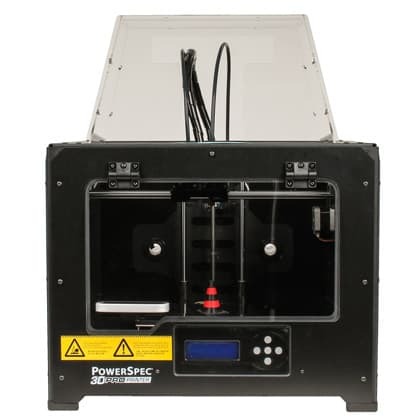 Alongside the PowerSpec 3D Pro, the package also contains a power cord, USB cable, sensor line, filament tube, two spool holders, the dual extruder mount, 4GB SD card, Hex wrench, screws, bolts, and assembly kits for the acrylic hood and door. Installation met a roadblock out of the box as we couldn’t spot a quick start guide. We finally figured out that the SD card contained all the documentation for the printer. Other connectivity options aren’t necessarily a bad thing, but a least a sheet explaining this would have saved us considerable trouble trawling through the PowerSpec website to figure out what was needed to get the printer up and running. Calibration is relatively standard for devices without automatic leveling, although we did find that the three wingnut configuration differed from the four wingnut arrangement mentioned in the user guide. More than likely this is an editing oversight from a previous iteration of the 3D Pro documentation but is a cause for concern when it comes to quality control. Printing results were unsurprisingly akin to what comes out of a Replicator 2, but with a certain knockoff veneer. The quality was respectable without producing anything worth writing home about. 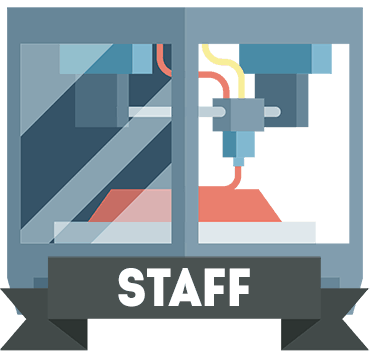 Finding the right settings is somewhat or a rigmarole but once established, the printer is adequately performant and should suit most hobbyist makers. PLA suffers from a lack of adequate cooling even with the door open and the cover removed. The biggest culprit is the absence of an active cooling fan fit for purpose. The result was invariably a few blotching problems and globule build ups especially at lower resolutions, but nothing that destined prints to the trash can. ABS printing was sometimes erratic due to a gap that exists between the front door and the frame but overall produced decent results. We’d say the printer is far better suited to ABS models than PLA by a long shot. When buying a PowerSpec 3D Pro, you are very much buying into a tacit agreement that the company will provide little to no after sales support, and you’ll need to tackle any troubleshooting yourself or seek help from fellow owners. The PowerSpec website is notoriously unhelpful with barebones FAQ sections and a support team that is among the hardest to contact for assistance. The warranty is an underwhelming 180 day limited deal with very to little leeway from PowerSpec. Buying from a third party is the way to go for extra peace of mind and at least a refund policy for defective models. If you are a fan of the MakerBot Replicator 2, then the PowerSpec 3D Pro will be familiar even down to the looks. For a novice, the PowerSpec’s low cost is unquestionably attractive, but the variable quality of the prints may be too troublesome. There’s nothing special or unique – it’s a direct copy – and is as functional as a 3D printer can get. The simplicity is one of the 3D Pro’s greatest assets and negatives, in equal measure. Not great, not bad, the PowerSpec 3D is a lackluster printer that works well enough, but won’t blow anyone away, especially when we consider the near absence of support. With a few choice improvements, the 3D Pro could shine through.